There is a lot of buzz around Artificial Intelligence in the world today. In one of my earlier post, I talked about the skepticism around AI. You can read it here. In his budget speech, on 1st Feb 2018, the Finance Minister of India called upon NITI Aayog (premier policy Think Tank of the Government of India), to establish a national program that will direct efforts and energies towards making India a world leader in the area of Artificial Intelligence . Last week, the NITI Aayog released a discussion paper on National Strategy for Artificial Intelligence (NSAI). The paper can be found here. The paper provides a detailed blueprint of the way forward for India to leverage the AI technology for improving economic and social well being of its people. This post is aimed at providing a brief on the strategy. Artificial Intelligence is going to play a very significant role in shaping world economy in near future. The NSAI looks at how different countries in the world are focusing their efforts on research and application of AI to garner economic benefits. US, China, Japan, UK and France have all devised their respective strategies to leverage AI capabilities. These countries have also established a governance mechanism for implementation of the strategy. Countries across the world have realized that effective formulation and implementation of AI strategy will need involvement of Industry and Academia along with the Government(s). The Economic Impact of Artificial Intelligence focuses on how AI can be used to improve productivity and augment human intelligence. It also looks for ways of reusing the AI capabilities generated in one sector/domain in other sectors. This is where the uncharted territories will be explored to find and create new ways of generating value. Social Welfare aspect focuses on improving the quality of life for people. India faces very unique kind of problems. Due to large population and lack of availability of enough number of professionals, people are deprived of some basic services like healthcare. Social welfare aspect of NSAI aims to address such problems. AI as a Service aspect aims at making India a provider of AI services. India has a proven track record in providing technology solution and is already being called the SAAS capital of the world. The AI solutions created and deployed for India can be easily implemented and deployed for other developing economies. Five sectors have been identified as focus areas that, as per the NSAI, will benefit the society most through use of Artificial Intelligence. These sectors are Healthcare, Education, Agriculture, Smart Cities and Smart Mobility. Application of AI in these areas will certainly give Indian economy a big push through improved productivity and new capability generation. There are, however, some other sectors/areas that should also be considered. According to a recent report, the violence in India caused the economy an estimated 80 lakh crore rupees (in constant purchasing power parity) in 2017. In actual, on ground, it cost India losses around 9% of its GDP in 2017. While these numbers are estimated, there is no doubt that conflicts and violence cost the economy, dearly. Internal security and law enforcement should also be considered as a focus area for AI. China has reported cases where they could catch criminals through use of facial recognition. While we may not necessarily want to replicate it, India should leverage AI to predict potential conflicts so that preventive measures can be deployed in advance. This will help the economy while saving precious lives. The NSAI recognises the lack of research culture and unavailability of adequate (both in quantity and quality) training data for generating and training of AI algorithms, respectively. These problems need a joint effort from the Industry, Academia and Government to fix. NSAI proposes the PPP (Private Public Partnership) model to promote research and application of AI. 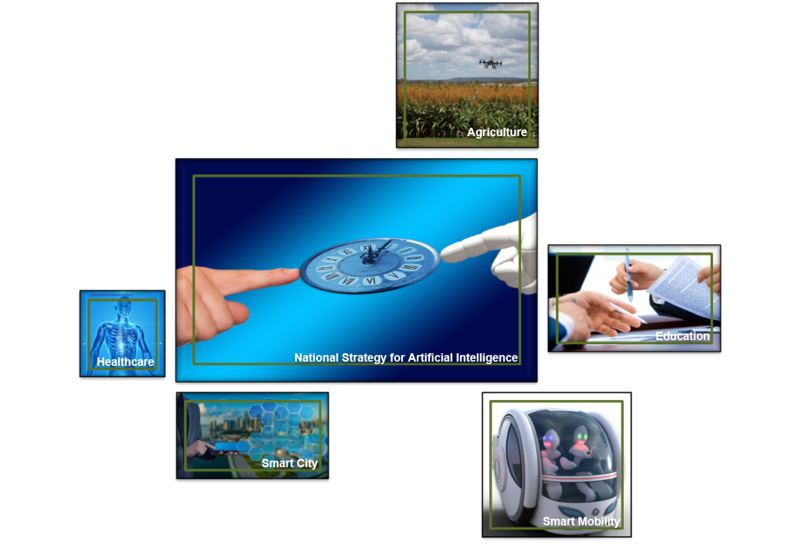 To promote the core AI research and its application, NSAI proposes a four tier framework with respective tiers focusing on creation, integration, application and commercialisation of AI technology. NSAI also proposes that Government of India should take the lead to ensure international cooperation in the area of Artificial Intelligence research to create People’s AI. This will be similar to the international cooperation currently underway in the area of nuclear research. This international cooperation, ‘CERN for AI’, will help address problems common to the world while paving the way for inclusive AI and standardisation. With increasing prominence of Artificial Intelligence, the job market is changing. While the automation aspect of AI may cause certain repetitive jobs to be taken away, the industry is suffering from skill shortage as the skills needed to create AI solutions are not easily available. NSAI proposes a two pronged approach to address both the problems. It calls for re-skilling of the employees in new job functions of the AI value chain (e.g. Data Annotation, Data Curation, Image Classification and so on). The NSAI also recommends re-alignment of education sector to address the needs of Innovation economy. With initiatives like ATL (Atal Tinkering Lab) in schools, the students will get exposed to project environment that facilitates application of knowledge. NSAI also calls for better collaboration between Industry and Academia. My observation is that the collaboration mechanisms identified by the NSAI are already present and they do not seem to be very effective. In India, such collaboration will need to be better incentivised (and probably facilitated by a government authority). The NSAI identifies various components of Artificial Intelligence value chain as below. All these components need to work in tandem for the development of sustainable AI solutions while keeping the cost in check. To facilitate their collaboration, NSAI proposes creation of National Artificial Intelligence Marketplace (NAIM). The NAIM will have a Data Marketplace, Data Annotation Marketplace and the Deployable Model & Solution Marketplace. The NSAI proposes that the government should act as a catalyst and facilitate (through enabling regulations) the creation of the NAIM by private players. The NAIM will get the Corporates, PUSs, Academia and Startups on a common platform and will enable collaboration between various stakeholders. This will considerably reduce the AI adoption effort for all the members of ecosystem. India is home to more than 1.3 billion people and it amounts to 17.74% of world population. This huge population and the diversity in India creates a unique class of problems to solve. While India is currently the fastest growing large economy of the world, its core sectors like Agriculture, suffer from inefficiencies and loss of productivity. Traditional ways of solving the problems are not sufficient to address these inefficiencies. For India to realise its full potential, it needs to harness the capabilities of emerging technologies like Artificial Intelligence. Artificial Intelligence is disrupting the traditional technology space and given India’s strengths in the technology arena, India can be world leader in AI. India’s NSAI shows the road-map to world leadership. But, as always, execution of the strategy will determine the outcome.